It's probably not really fair to say that we hate bicyclists on the streets of L.A. (and if you yell that out of your car window, you might get arrested and/or sued), but let's just say that cyclists and motorists don't exactly happily cohabit here. 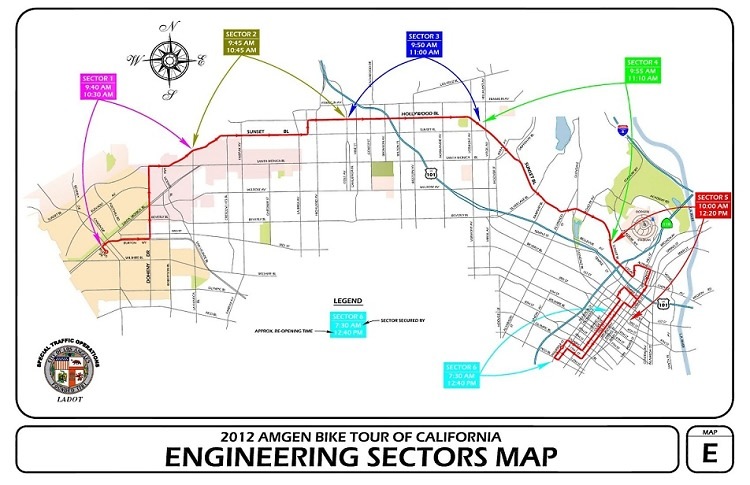 Unfortunately, with the Amgen Tour Of California race rolling through town on Sunday, that uneasy peace might not get any friendlier, as the Beverly Hills-Downtown race route means rolling closures of major streets across the many of the neighborhoods that we call home. In other words, you may want to consider passing on your Sunday brunch invitations. Courtesy of Total Traffic Los Angeles, we know that the route will run from its starting point on Rodeo Drive up Doheny, where the racers will then traverse the Sunset Strip, cutting up to Hollywood Boulevard just in time to completely eff up the "Sunday bus tours & movie theater" traffic and also to put the cyclists at risk of being assaulted by a crazed Jack Sparrow, Batman or Spongebob. The race then cuts back down to Sunset for the run past Dodger Stadium, and then enters Downtown for a long finishing loop down and around the Staples Center that should combine with the afternoon Kings and evening Clippers game to create a traffic situation that will make grown men openly weep. As you can see from the map below (click for a larger version), not only does this effectively sever most peoples' easiest way to get across town, but depending on where you live, the planned times for reopening the "sectors" of closed streets vary wildly, so read those multicolor boxes along the top of the route to see when your part of town will be open for business again. And if you live downtown, seriously, don't be a hero. Either only go out in walking distance (even the trains will probably be obscenely packed due to the games) or just stock up and stay home.